The short story "The Duchess and the Jeweller" by Virginia Woolf presents a narrative technique "stream of consciousness". She used in this story the elegant style common to the upper class. The first part of the story describes the house of the jeweler and his thoughts and attitude in terms of what he owned and the goals he had achieved. He had a luxurious house in the center of London, he was very satisfied with his career. “Behold Oliver,” he would say, addressing himself. “You who began life in a filthy little alley, you who . . .” and he would look down at his legs, so shapely in their perfect trousers; at his boots; at his spats. They were all shapely, shining; cut from the best cloth by the best scissors in Savile Row." He came to the jeweler's shop and followed by jealous looks into a small room. He was informed that Duchess had come to meet him. The fact that such an aristocratic person wanted to meet with him raised his confidence, he thought "The Duchess of Lambourne waited his pleasure; the Duchess of Lambourne, daughter of a hundred Earls. She would wait for ten minutes on a chair at the counter. She would wait his pleasure. She would wait till he was ready to see her." The contrast between the rich and the poor, between aristocrats and people of a humble origin is one of the main ideas of the story. Here is how the presence of the Duchess changed the atmosphere in the room: "Then she loomed up, filling the door, filling the room with the aroma, the prestige, the arrogance, the pomp, the pride of all the Dukes and Duchesses swollen in one wave.". Something had happened before which made him quite suspicious of the Duchess intentions. The lady had brought the pearls asking the Jeweller great money for it. The Jeweller had already had an experience of being deceived by her and he thought about the pearls "But real was it, or false? Was she lying again? Did she dare?" She moaned that she did it for her children including Diana her daughter who he loved. The Duchess said that the duke, her husband, was a gambler. If he knew about her intentions to sell the pearls, he would have killed her. She asked to keep that agreement a secret. He would have called his assistants to test the pearls, "He stretched to the bell." but ... She interrupted him “You will come down tomorrow? ... The Prime Minister—His Royal Highness . . .” She stopped. “And Diana,” she added. Oliver took his hand off the bell." He started filling the check and for a moment he stopped writing. “Oliver!” the Duchess entreated—it was “Oliver” now, not “Mr. Bacon.” “You'll come for a long weekend?” Alone in the woods with Diana! Riding alone in the woods with Diana!" Along with the subject of a social inequality in this story, we have also plot-lines referring to the way how people manipulate each other and their attitude to love. 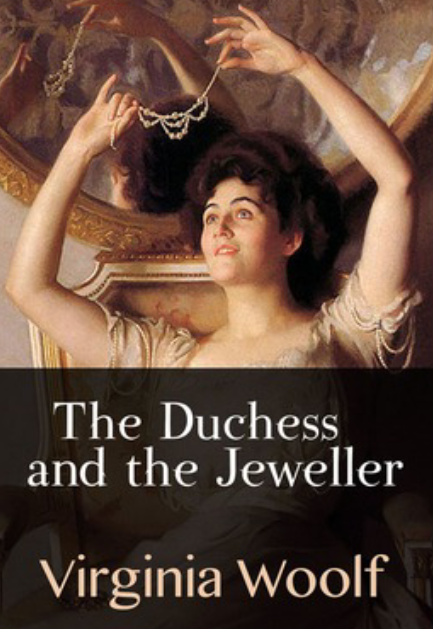 The author showed how the Duchess, who knew about his fond feelings to her daughter, exploited them for getting money. Virginia Woolf left readers the possibility to decide if the main character played a negative role in the story (he was a self-centered and arrogant person) or a positive one (because he was sincerely in love with the girl and that feeling overcame the power of money). The literary style which Virginia Woolf used was defined by critics as a flow of consciousness. She wrote long sentences and complicated figurative expressions are relevant to the social background of the story and presented readers the atmosphere of upper-class in England of the previous century.